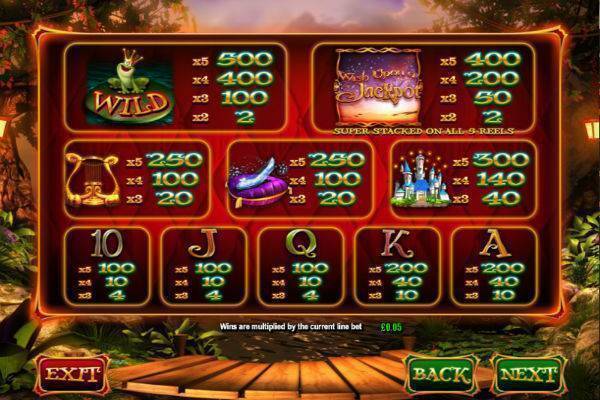 Wish Upon a Jackpot is a magical 5 reel 20 payline slot from Blueprint Gaming. This game will beam you into a land of fairytales, with castles, frog princes, cat heroes, wolves, glass slippers and more familiar characters from famous stories, including a fairy godmother that will come to deliver bonuses with special prizes. Despite the name, Wish Upon a Jackpot is a video slot with no progressive jackpot attached. Nevertheless, this is a fun slot with no less than 8 bonus games! Experience the magic for yourself at one of our recommended slot sites! The story starts easy. Set your bet size with the “Total Bet” button. There are little up and down arrows there where you can adjust your bet size. It starts at a minimum bet of £0.20 per spin and can go all the way up to £200. The 20 paylines are active always, which means that it’s just a penny per line. Once you’ve set your bet size, you’re ready to hit spin. You can of course adjust the settings in Auto Play to sit back and watch the reels spin. The Book symbol acts as a Scatter and can trigger one of the 4 Bonus features. The fixed jackpot prize in Wish Upon a Jackpot can be won in the base game when you spin 5 of the Prince Frog symbols. This will pay you 500x your line bet. The next prize if 400x your line bet with 4 Prince Frog symbols, or 5 of the Wish Upon a Jackpot logo symbols. 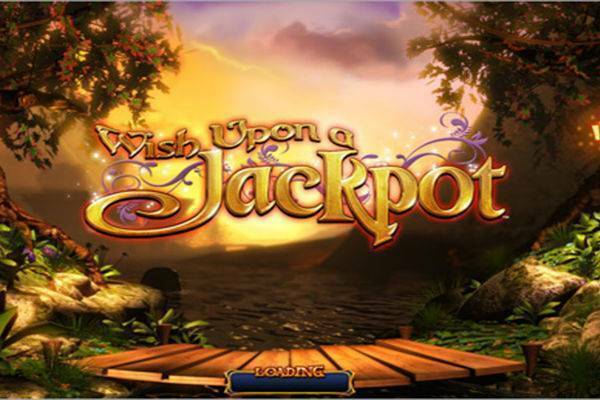 Wish Upon a Jackpot is filled to the brim with all sorts of bonus games and special features that will break away from the reels. Without further ado, here’s what this slot is famous for! Pinocchio Wilds: The young lad will slide down the reels and paints a streak of Wild symbols as he slides. With these extra Wilds, you might get some extra wins. Gingerbread Man Wild Reels: The Gingerbread Man will cause one of the reels to turn completely Wild. Puss in Wilds: Our hero, Puss in Boots will appear and slash more Wilds across all the reels. Fairy Win Spin: If you’re looking for a guaranteed win, this might be your pick. Here, the fairy will turn a random symbol into another one to deliver a win for you. Bonus: Select this and you’ll enter the Fairy Tale Bonus, which has even more special bonus games you can choose from. 3 Little Pig Free Spins: With each free spin, the little pigs will turn a random symbol into a Wild. This will make it a Sticky Wild so it will stay there until the Big Bad Wolf appears to huff and puff and blow them all away. At the end of the round, you’ll be randomly awarded more free spins. Rapunzel Free Spins: You have unlimited free spins to rescue Rapunzel. In this game, you can also get a special Prince Charming symbol, and when he appears on the reels, he will also start climbing up the tower to rescue Rapunzel. As he gets higher, your wins will also come with higher multipliers (up to 5x). Once the Prince reaches the top of the tower, the bonus round ends. Jack and the Beanstalk: Here you’re on a multiplier trail to the Golden Goose. You select magic beans along the way, which will either say Advance, or Collect. Advance will get your further along the trail, while Collect will end the feature and award you’re the prizes you have to date. If you make it all the way to the Golden Goose at the end, you can win up to 1,000x your total bet! Rumpelstiltskin’s Deal Maker: Rumpelstiltskin will make you an offer of a cash prize, or a mystery bonus. You can decide to take it, or go for a mystery bonus in the hopes that you can get something better. Wish Upon a Jackpot is a beautifully drawn slot. Set in the woods, the game environment is warm and enchanting, and the characters from the fairytales are endearing. In the basic game, you’ll have an upbeat piano playing a fun little soundtrack for you as the symbols plop into place. Once you enter the bonus rounds, the music and sound effects will bring the game even more to life. Wish Upon a Jackpot is a proper cinematic experience! Once in a while, there comes a slot that really breaks away from the humdrum of spinning reels. Yes, Wish Upon a Jackpot still has reels, but when you hit one of the bonus games (of which there are many! ), you will enter a whole different universe. So even though there is no progressive jackpot here, we’re more than willing to forgive the game makers thanks to the excellent design and charming bonus games and features! Enjoy Wish Upon a Jackpot at one of these slot sites!